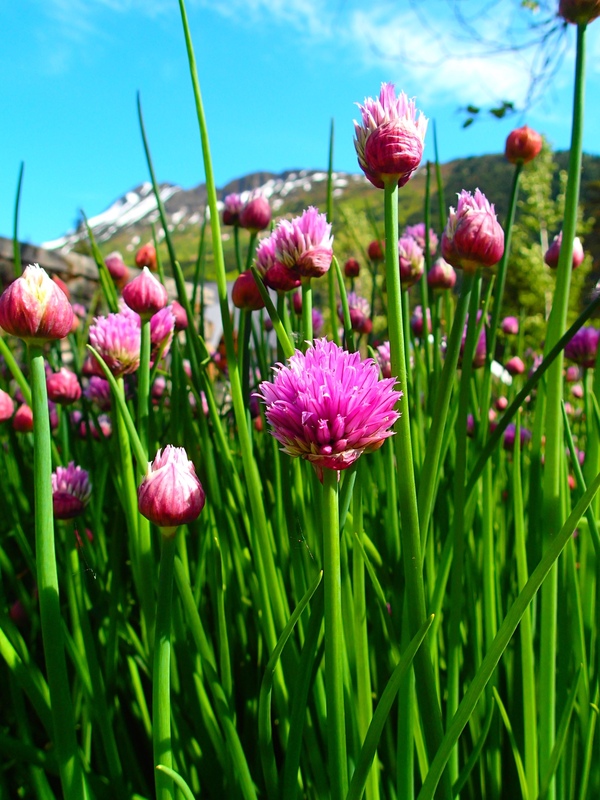 I love these purple mountain flowers. A classic Alaska look! Whittier, Alaska was my final port of call from my epic cruise from Vancouver. It was a pleasure to be on land again and a delight to arrive into another majestic town, a short drive away from Anchorage. I made many friends on the cruise, is that a surprise? What was funny is the first couple I met in line waiting to board onto the ship, was the same couple I walked off with. We had a full day planned in Anchorage together, I was more than pleased about that, new best friends! Chris and Rolfe were easy going Aussies and fun to hang out with. Travelling by bus from Whittier to Anchorage was the most scenic part of Anchorage. Surrounded by huge mountains and green trees and wild life, our salubrious bus driver gave a running comedic commentary as we bussed along into town. Being the seventh best drive in America, it made me wonder how it could get any better? And who gets that job to decide the best roads in the county? Now there is a job I could do! 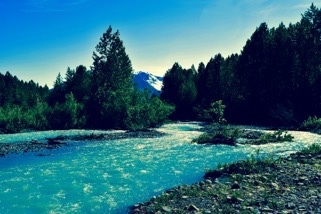 We came across this peaceful little river on our day trip adventure. On arrival into downtown Anchorage, I must admit I was not too impressed. The town is very square in design, bland in view, no scenic lookouts and plenty of medium size brown boring buildings. They did have nice decorative flower pots, but I couldn’t work out why they would plant the town in the least scenic part of town? After walking around a local market and a few blocks downtown with my new company in tow, we found a Japanese restaurant for a lunch time feast. My friends were farmers from Queensland, just outside of Rockhampton. They were really lovely people and great company for the day. Once our tummies were bursting with sushi and green tea, we decided to hire a car and drive out to capture the more scenic part of town again. This turned out to be a great idea. We first drove to a small resort style place which featured a cable car flying up high to a mountain top. We saw two gung-ho paragliders jumping off from the top peak, they were up and back over 10 times that day! Not a bad way to spend an afternoon. After a photo shoot and afternoon tea at the base of the mountain we made our way to the Wildlife Sanctuary, which was awesome! 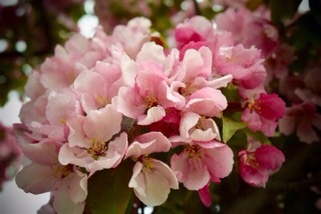 I love capturing flowers, I am obsessed with their pretty colours and natural energy. 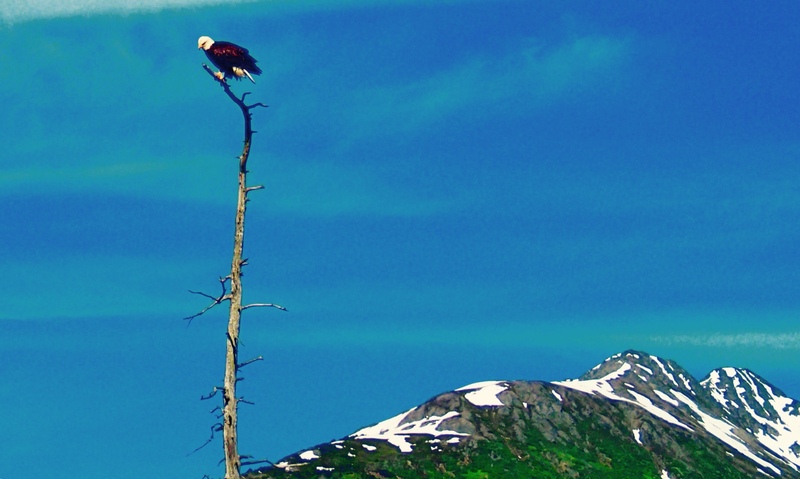 An awesome eagle perched up high on a tree at the Wildlife Sancturary. It was so great to see animals I had never seen before, and they quite happily posed for the tourists. The sanctuary homes many abandoned or injured animals including bears, bison, eagles, ducks, and moose. I was really impressed and so happy to see some unique animals and snap them from safety. I love hiking in Canada but I am paranoid about being eaten by a bear! Love the way he is posing for me! We then made our way back into town for dinner at the Hard Rock Cafe. A really funky place and tasty food, surprisingly I had never been to this mega chain conglomerate before. My friends dropped me off at my new hostel and I waved a fond farewell. I hope our paths will cross again, I would love to go and spend some time on their farm in the future. 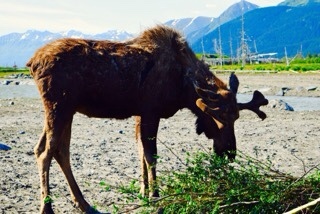 A little old moose having a nibble. Base Camp Anchorage hostel was situated a little out of town, but it proved to be a really funky, friendly and relaxing place to stay. The place is run by travellers and everyone was chatty and easy going. My kind of place! 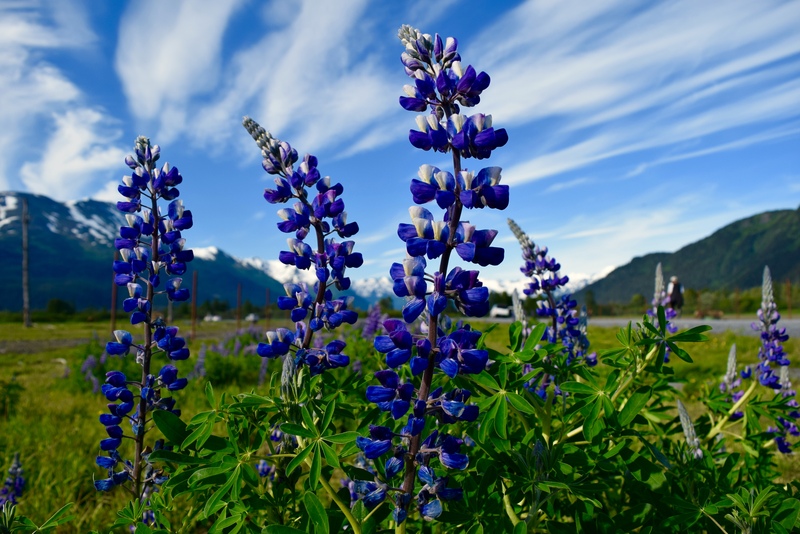 I met some new people in the morning, young travellers who were up in Anchorage for seasonal work, mostly tour guiding, or to simply travel and enjoy the natural surroundings. We borrowed some bikes from the hostel and enjoyed a scenic ride around the waterfront right up to the airport. There were plenty of green birch trees and lush forest, water and ducks, and rare sightings of the distant majestic mountain of Denali in the background. We had a really yummy lunch with my new cycling buddies at this place called ‘The Organic Oasis’, the freshest and yummiest salad, and healthy lunch and fresh juice I have had in ages. I really like to look after my health and value healthy nutritious food. I relaxed in the afternoon in the warm sun and made the most of my time at the hostel meeting other travellers and catching up on the rare use of internet. I am really inspired to start writing some ebooks so that will be something to work towards in coming months. A fellow traveller gave me this gold mine tip, and it sounds like a good one to me! I wasn’t too hungry for dinner, but a new lady Reetta had arrived to my room that day from Norway. I woke her from her jet lagged extended afternoon sleep and we made our way out for a light meal, at her request. It was great to meet another lovely person and learn a little about her life. She was in town for a seminar on Cultural History, she was very interesting and easy company. After a yummy raspberry sorbet I was ready for bed, my brain was tired and needed rest. Anchorage was a great way to finish my cruise and I am glad I stopped in for a few days to replenish, rest and recuperate before my next leg of my worldwide journey. As my plane tip wings soared into the sky departing Anchorage for Calgary, I smiled. I was happy! Travelling is such an adventure, every day is a new story, an opportunity, and the best part is the feeling of freedom. I love my lifestyle and I am so pleased I pushed out of my comfort zone yet again to explore this big magical world. I look forward to sharing the next stage of my journey with you from Calgary. I am excited to be meeting up with a great girl I met in Cuba many years ago. She is now running her own dance studio and it will be awesome to see her again and maybe squeeze in some dancing. I will be then heading out to the mountains and the natural beauty of the Rockies in Jasper. 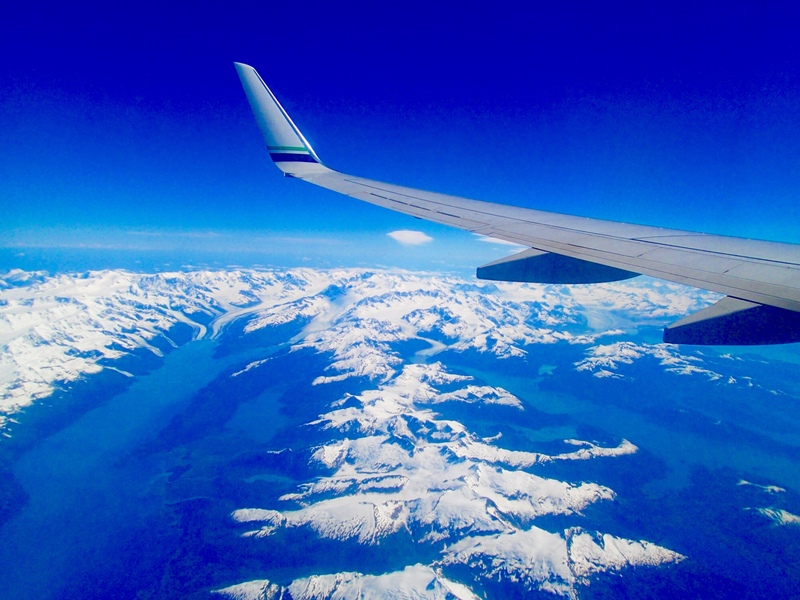 Wow, climbing out over the mountains and snow capped peaks was a real treat as we flew out of Anchorage. Snow capped peaks flying out of Anchorage. 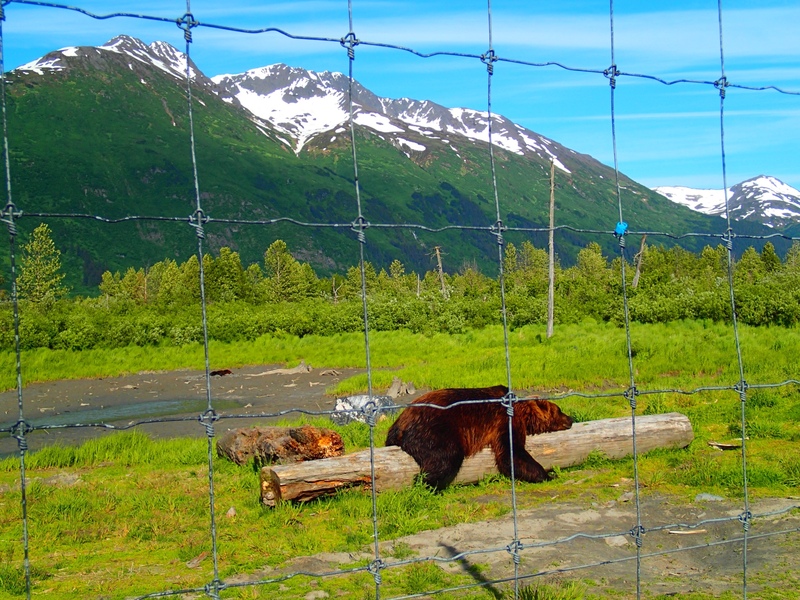 ← Cruising Alaska Part 2: Thrills and Spills.